For over 45 years the versatile and beloved Bell UH-1 �Iroquois� has been the backbone of Army Aviation. The familiar �wop wop� sound of the rotor blades was an unforgettable icon of hope for the wounded and a battle cry of the Air Cavalry. Filling multiple roles including Transport, Medivac, Search and Rescue, and Gunship, the adaptable platform was ready in a moment�s notice to carry out the every mission tasked to it. 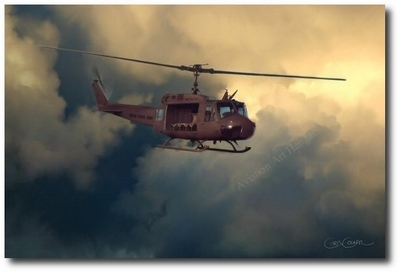 Artist Chris Cosner has logged hundreds of flight hours in the famous �Huey� and remembers how natural and peaceful it fit high among the heavens, far from the chaotic missions it carried out on the ground below. Flying open in the �slick� configuration, The Huey embarks on another mission of transport, rescue, or mercy. 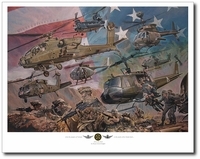 This painting is dedicated to all the men and women who were touched by the Huey as pilots, maintainers, troops, and everyone else who eagerly look to the sky when the familiar �wop wop� sounds fills the air.